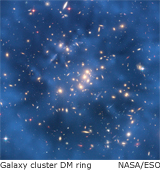 This course provides an overview of modern cosmology. The lectures will cover the expansion of the universe, redshifts, the center and edge of the universe (are there any? ), cosmic horizons, scientific models of the universe, cosmic microwave background, neutrinos, origin of elements in the universe, the early universe, cosmic inflation, as well as dark matter and energy. The lectures in April will introduce to you Einstein's special and general theory of relativity and their application to black holes. AST301, 302, or 303, or an equivalent descriptive introduction to astronomy of one semester or more. Class meets at WEL 3.502 on MWF 9-10. There will be 8 in-class exams, all of which consist of 10 multiple-choice questions. (See the course schedule for the dates of exams.) The penalty for cheating on an exam is a score of zero for the exam, and the zero will be included to calculate the final grade. There will be make-up examinations ONLY for students with valid excuses. Reasons for absence must be presented in advance of examination. No make-up exams will be arranged for those who did not notify the lecturer about their absence in advance.